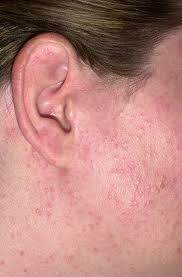 A sun allergy is an immune system reaction to sunlight, most often, an itchy red rash. The most common locations include the "V" of the neck, the back of the hands, the outside surface of the arms and the lower legs. In rare cases, the skin reaction may be more severe, producing hives or small blisters that may even spread to skin in clothed areas. Sun allergies are triggered by changes that occur in sun-exposed skin. It is not clear why the body develops this reaction. However, the immune system recognizes some components of the sun-altered skin as "foreign," and the body activates its immune defenses against them. This produces an allergic reaction that takes the form of a rash, tiny blisters or, rarely, some other type of skin eruption. Sun allergies occur only in certain sensitive people, and in some cases, they can be triggered by only a few brief moments of sun exposure. Scientists do not know exactly why some people develop a sun allergy and others do not. There is evidence, however, that some forms of sun allergy are inherited.